Shop all AMD Ryzen™ 7 products now. AMD SenseMI Technology. Technology that thinks. Every AMD Ryzen processor is multiplier-unlocked from the factory, so you can personalize performance to your taste. AMD provides the AMD Ryzen Master utility to access this powerful advantage. 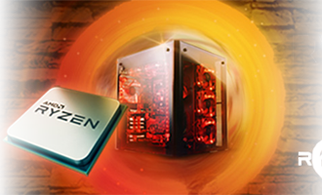 AMD Ryzen Master provides for up to four profiles to store custom clocks and voltage adjustments for both the Ryzen™ CPU and DDR4 memory. You can park cores and adjust memory timings, too. AMD offers premium thermal solutions for people who care about the way their PCs run, sound, and look. We’ve listened to our customer feedback and designed our newest coolers to deliver near-silent operation, bolstered with capable thermal hardware – with no increase in pricing when these new coolers have been added to existing processors – for a tremendous value. We've upped the ante with a whole new line of AMD Wraith Coolers for Socket AM4 and the new Ryzen™ processor. From the small Wraith Stealth, to the capable Wraith Spire, all the way to the top-of-the-line Wraith Max, every Wraith cooler features near-silent acoustics paired with capable thermal performance. In addition, Wraith Coolers bundled with AMD Ryzen™ 7 processors feature color-configurable LED illumination so your Ryzen™ processor looks as good as it performs.